Blog > Green Manure: Good for us, the environment, and bees! Purple tansy is a type of ‘green manure’: a plant that can help sustain agricultural systems in an environmentally friendly way. It is a fast growing plant with an extensive root system, which improves the quality of the soil structure. It blooms in summer and is dug back into the soil in autumn, releasing nitrogen and other that will allow the next plants to grow successfully. Using green manure plants like purple tansy eliminates the need for chemical fertilisers, making the entire growth process fully organic and better for the environment. Many other crops can be used as green manure. Lucerne, oats, rye, mustard and soybean are all easily available for use in both agricultural processes and in your own personal garden. Purple tansy has another welcome property in being rich in nectar and pollen, which attracts pollinators like butterflies and above all bees. 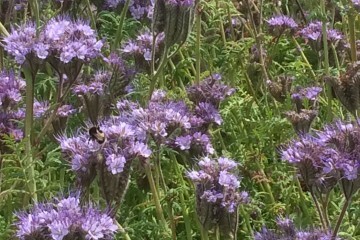 Any sunny day at the Rediscovery Centre, dozens of bees can be seen collecting pollen and nectar from the flowers. Pollen-rich plants like purple tansy are especially important in urban areas, where bees can struggle to find enough to eat. Green manure allows the garden to be 100% organic, so there’s nothing in the plants that could potentially be harmful to the bee species that use it. Many common pesticides can be very harmful, even deadly to bees – something that has worldwide consequences in terms of biodiversity, agriculture and the global economy. We intend the garden to be one small, repeatable step in the direction of greater biodiversity and sustainability.